Among the most common types of car accidents are rear-end collisions. Often, these crashes are caused by distracted driving and speeding. The resulting collision can leave victims injured. The most common injuries are whiplash, pinched nerves, and fractured vertebrae. The symptoms of whiplash may not appear until days after a collision. This makes it crucial to document a rear-end accident thoroughly and seek immediate medical attention, even if it appears minor. This will provide you with a record of how your crash occurred and the injuries you sustained, which can later be used to support your claim. Whiplash happens when the spinal cord’s normal curvature experiences a sudden change, such as the rapid backward and forward movement seen in a rear-end accident. Even in low speed collisions, this movement can damage joints, muscle tissue, and tendons. 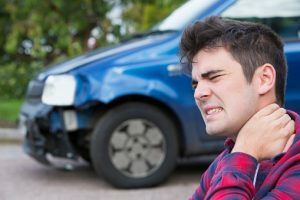 In severe accidents, whiplash can fracture bones and tear muscle tissue. Nerves are likely to get pinched between bones, causing pain to spread to other parts of the body. When visiting a doctor following a rear-end accident, there are multiple tools at their disposal to diagnose injuries. X-rays can locate bone fractures and a herniated disc or other significant ligament injuries can be found using a CT scan or MRI. With proper treatment, most cases of whiplash result in a full recovery. Medications to reduce pain, swelling, and muscle spasms. Not all cases of whiplash are preventable. However, wearing your seatbelt, proper headrest positioning, and correct posture can reduce your chances in the event of an accident. If you were involved in a rear-end accident and are suffering from whiplash, you deserve justice. Contact Smith & Hassler to fight for the compensation you deserve after your accident.